Vivus Architecture + Design » Archive » Happy Easter! As I transfered the recent photos from my camera, this image struck me as appropriate for the season. Of course, the cross-like image of the center stile and rail relates to Easter; the door itself has also gone through rebirth. This door was salvaged from the Master Bedroom of our house before demolition. It had been cut to fit the opening and was quite crooked. Its frame could not be salvaged. Mary and I were searching for a light fixture that would unify the space without too firmly defining where the table had to go in the room. 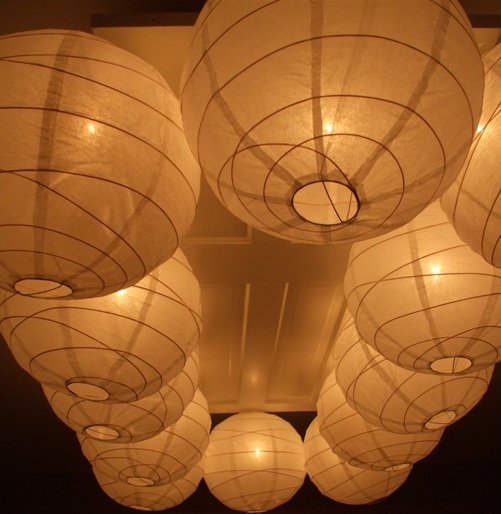 Upon finding these paper globes, the plan emerged to transform the door into a chandelier. 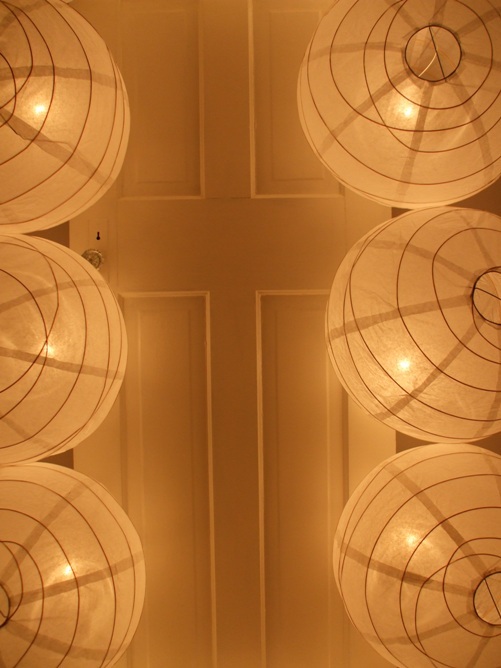 The door looks and feels great in the space; it floats lightly overhead despite its apparent visual mass. Over the weekend, we extended the table to seat fifteen people and it responded well to the challenge. On a dimmer switch, the door-chandelier can be bright enough to work under or subtle enough for gentle conversation over a glass of wine. Safe travels to our Easter guests and to yours. Posted in All Entries, Portfolio + Projects Comments Off on Happy Easter!